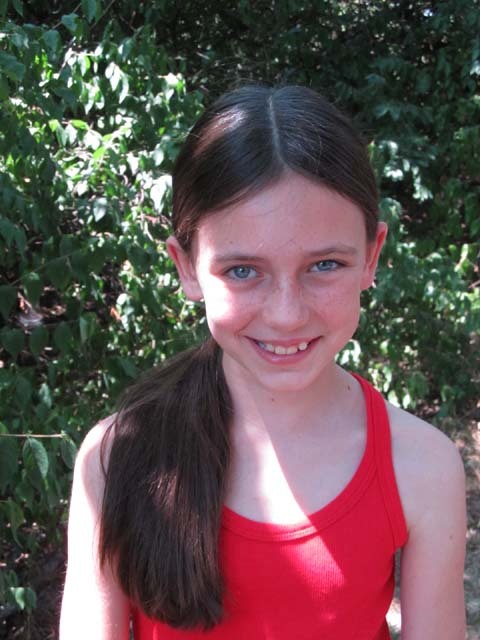 I’d like to introduce you to my 10-year-old granddaughter, Anna. She’s doing this blog. My grandma and I were looking for red-spotted purple butterfly eggs on a cherry tree in the yard, before it got too hot. Her cat, Callie, was laying down when a flash of red caught my eye. At that moment, I knew exactly what it was but forgot the name. 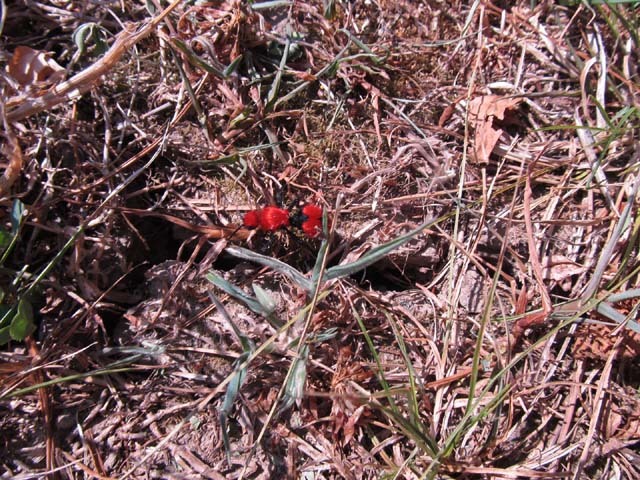 I stuttered, “There’s a red… velvet… bull… ant… thing!” Grandma said, “Ooh, that’ll be a great blog idea!” Later on we found out that it was nicknamed Cow Killer, but the scientific name is Dasymutilla occidentalis. But that’s a whole nother story. Let’s not get to that yet. 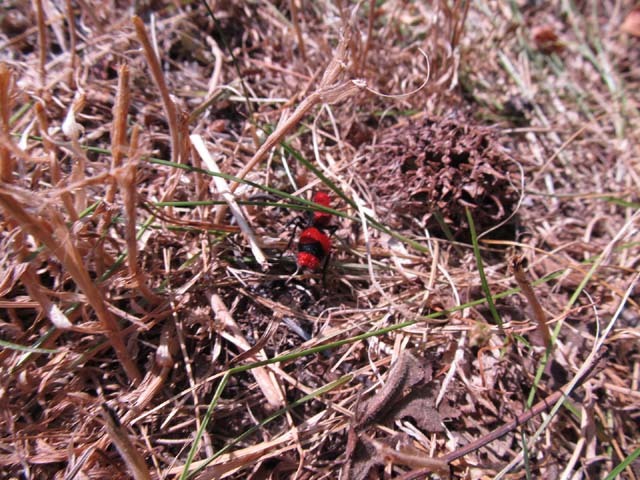 When I saw the ant, it was like a mini red bullet train. That little rascal was zooming away, and it was hard to take a picture because grandma and I were following it with the camera. The total length it went before stopping (and that we followed it) was 26 yards! It must have been a 5k for the little ant! The entire time it was going in a straight line very quickly. After the 26 yards was up, it went down into a crack that seemed random. We wondered if the crack was the ant’s destination. I was trying to get a picture of the crack she went in, and that’s when she came out and posed for this last picture. These are known to run quickly and fight ferociously. Cow Killers get their name from their painful sting. The pain is so severe that most people claim it can kill a cow. At least now you know the story I was talking about the “Cow Killer” name and how we found it :D.
The males have wings, and the females don’t. Apparently the one above is a female since it doesn’t have any wings. The females search for a bumble bee nest and lay one egg beside each brood chamber. The young feed on the bee larvae. Cow Killers are not actually an ant. They are a wasp. Warning to people who have allergies: Some people have severe allergic reactions to this bite. LOOK OUT! 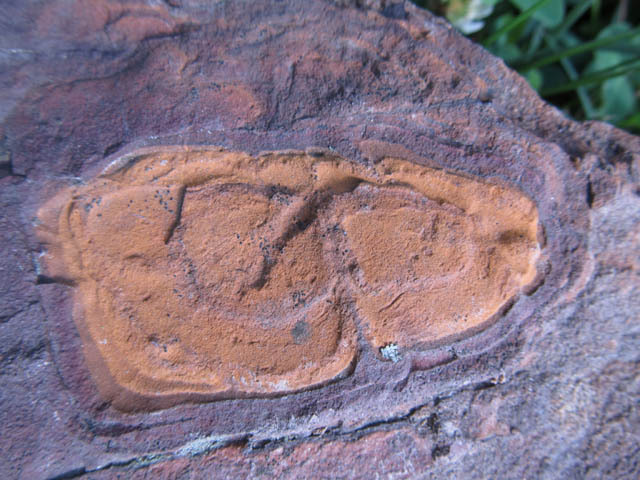 Yellow and red ochre in same rock. 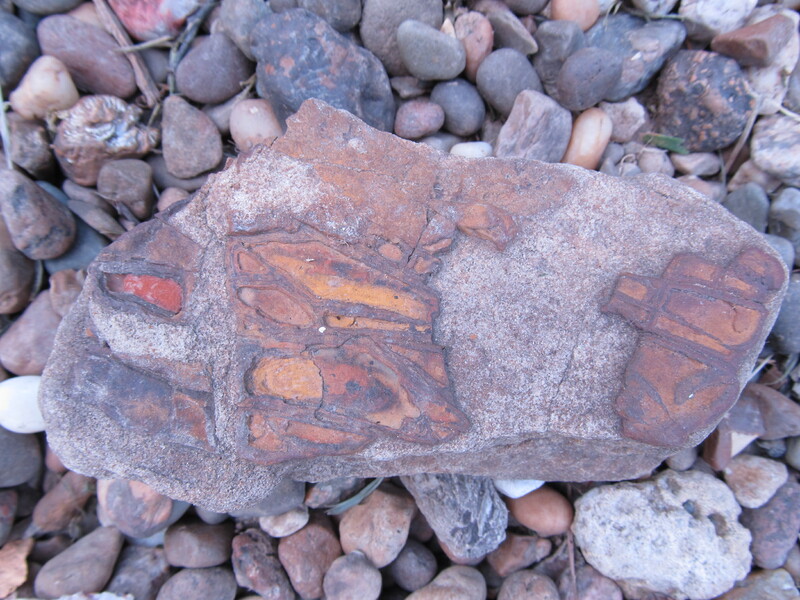 All the rocks in these pictures are sandstone, and all have iron in them. 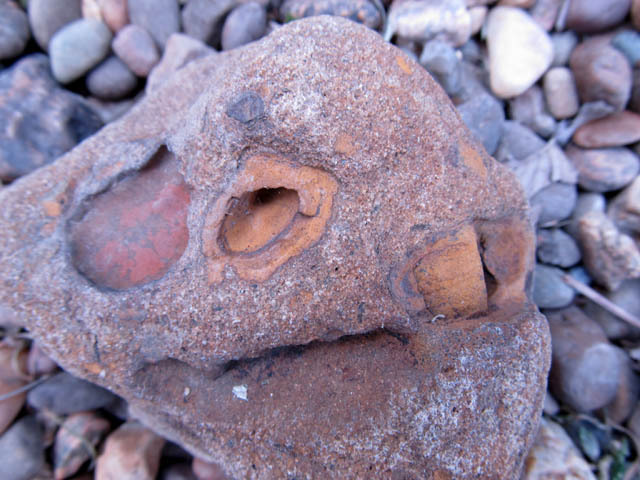 The designs were left by the softer sandstone eroding out. 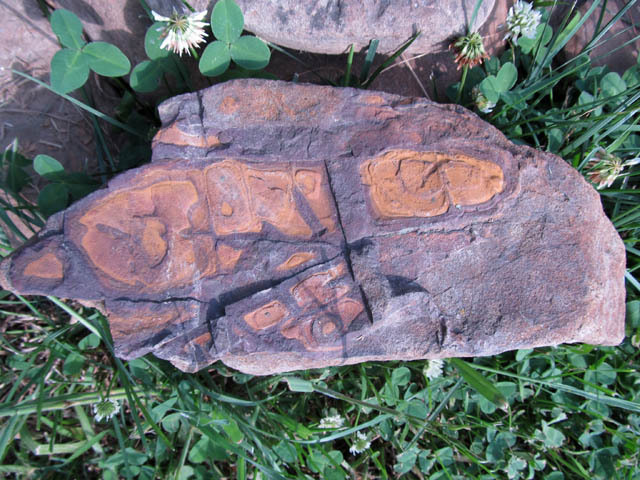 Over time ochre accumulated in these depressions. It was explained to me that it’s like rusting on a car. 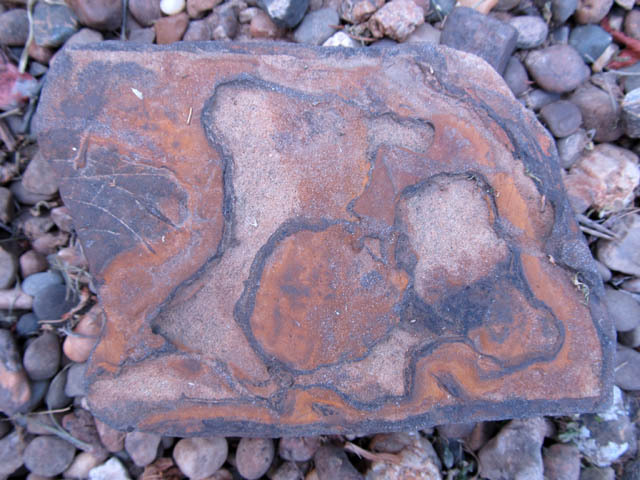 The ochre is a bi-product of the iron. The ochre can be brown, yellow or deep red, and is used in making artists’ paints. 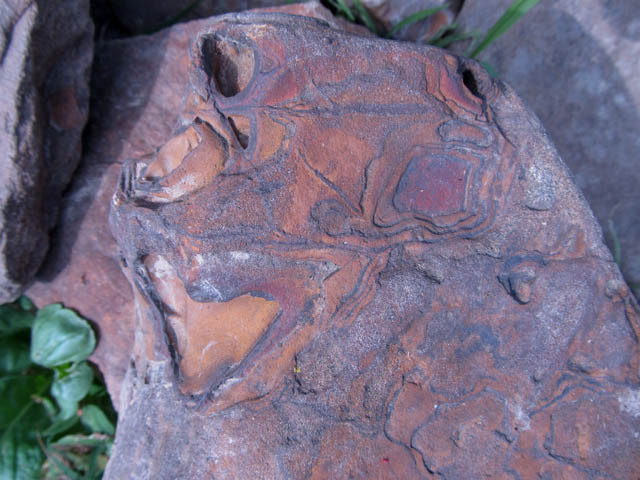 Can find endless designs in these rocks. This rock’s 10 inches wide. 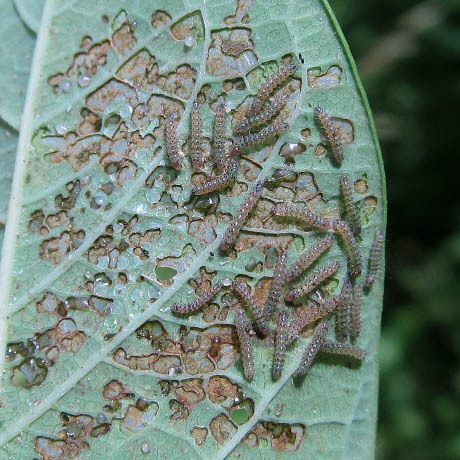 You know the butterfly numbers are low if the milkweeds look like this … no butterflies. 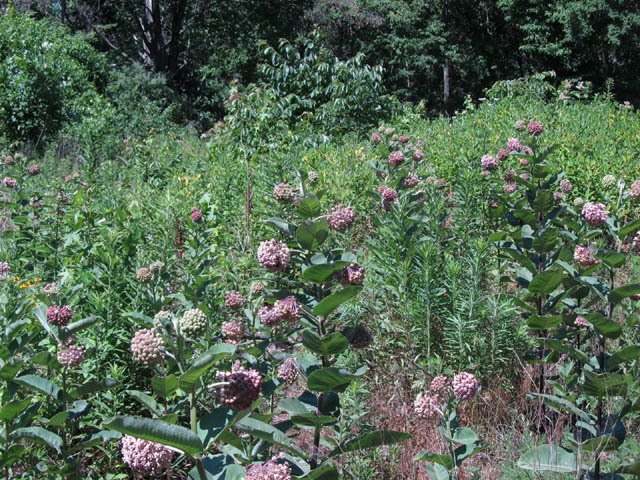 Milkweeds are a butterfly magnet. 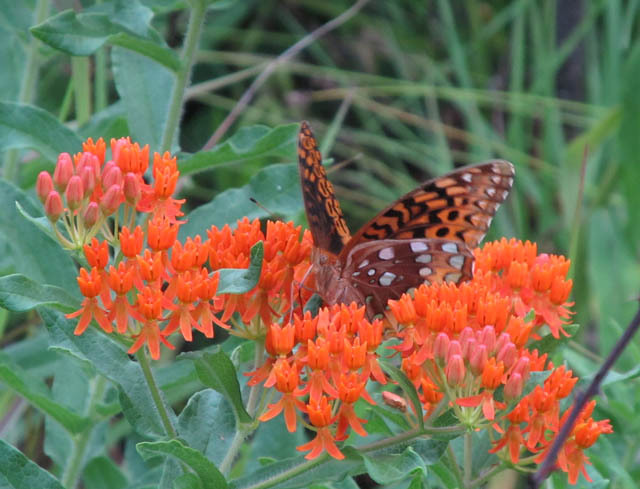 Great spangled fritillaries are large butterflies that commonly visit milkweeds. 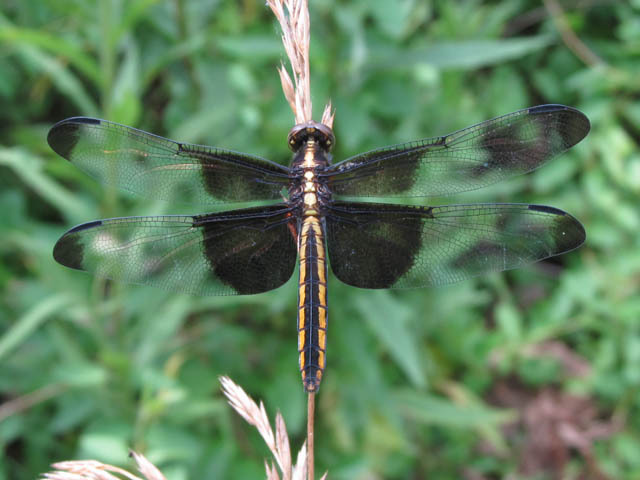 They have a 2 1/2 to 4 inch wingspan. Great spangled butterflies (Speyeria cybelle) are single brooded. The males begin flying in May, and the females emerge about a month later. 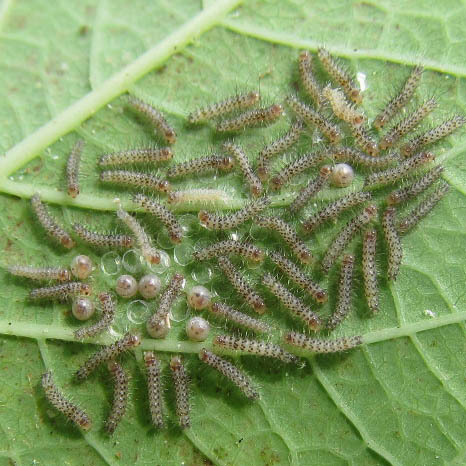 They only lay eggs on violets. This is where I think it gets interesting. The females fly around dropping eggs near violets, only sometimes laying them on the plants. The eggs hatch, and the teeny caterpillar doesn’t eat until the violets begin growing in the spring. They will drink water. So, how does something that teeny-tiny survive several months with no food? 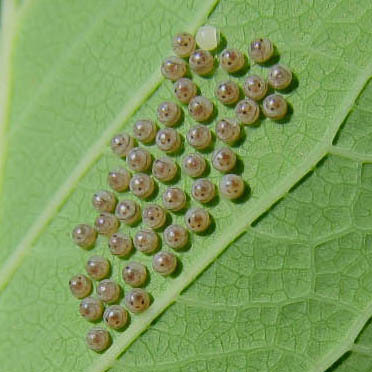 To compensate for the high mortality rate, a female can lay up to 2,000 eggs. 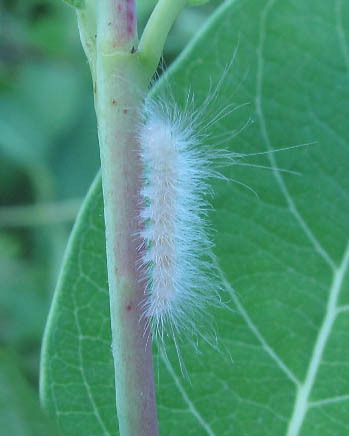 The chances of finding a caterpillar are slim, because they feed at night and are off the plant when not feeding. I have a story I just have to tell here. There’s a limestone barrens south of here. I visited it once during a high-butterfly-population summer. The butterflyweeds were in full bloom, along with purple and yellow coneflowers and much more. I stood 3 feet from a clump of butterflyweed and counted 17 butterflies on it! There were fritillaries, swallowtails, sulphurs, skippers and more. The whole barrens was a mosiac of colors and alive with butterflies. I’ve never seen populations like that since, and that was about 25 years ago. I came home and insisted my husband and youngest son (then 6 or 7 years old) go with me to see and experience what I had. We didn’t go until 3 days later, and there had been a strong storm in the meantime. 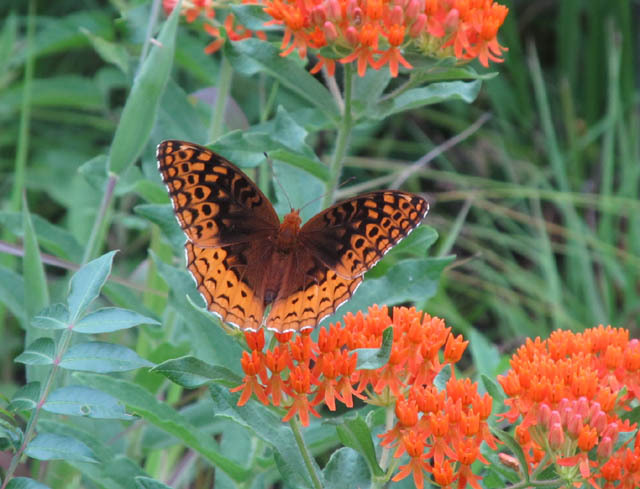 Storms can greatly affect butterfly numbers. There were still enough flying that they both were impressed. 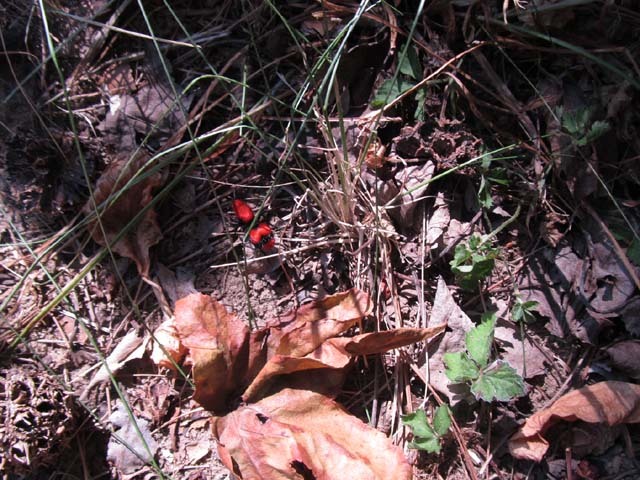 While there, Davis crossed the road and went up a short steep bank to a patch of butterflyweed. When I looked up, he had the butterfly net over his shoulder and had the index finger of his right hand out, trying to coax a butterfly to walk up on it. And me with no camera. Thank heavens, I still have a perfect mental image of him among all those butterflies. A brown thrasher was “arguing” with a mockingbird this morning. Apparently one was close to the nest of the other. They allowed for only a few pictures as they moved through the branches. One had a deep call note, and the other’s was a tad higher. Both sounded like they meant business. I had been trying to get pictures of both, since this is a relatively common occurance. With hopes of having a good picture of each, imagine my surprise when I put this picture on the monitor! 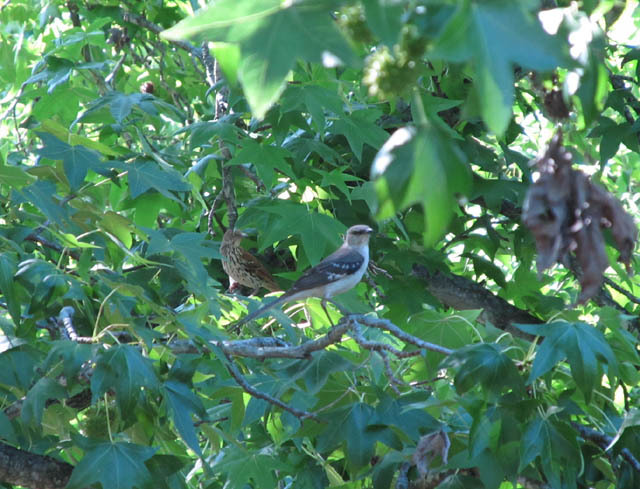 Northern mockingbird is a year-round resident here in southern Illinois. The brown thrasher returns early March and migrates south in October. Both usually nest in our yard every year. The “songs” of both are impersonations of other bird songs. Brown thrashers repeat each impersonation twice, and mockingbirds vary the number of times they repeat each call. This makes them easy to identify by their calls, without having to locate them to be sure. Years ago I was camping at my rural property. The brown thrashers had just returned, and a male was perched on a limb near the road. It sang and sang. You know the whistle a man does when calling his dog? 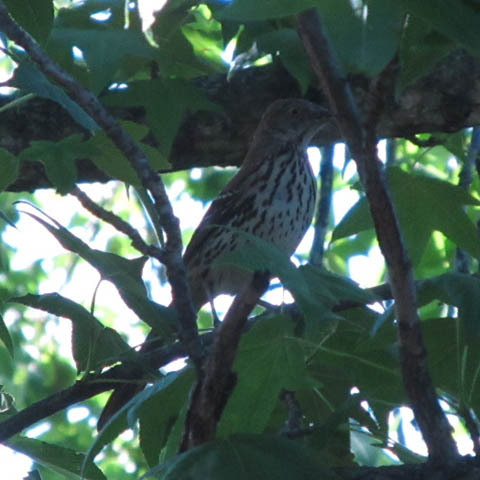 Well, the brown thrasher impersonated that whistle! The impersonators heard a lot of “KEITH” calls one summer when my kids were young. Keith was relentlessly hyper. I expected the brown thrasher to imitate me. It didn’t, but I always chuckled at the thought. 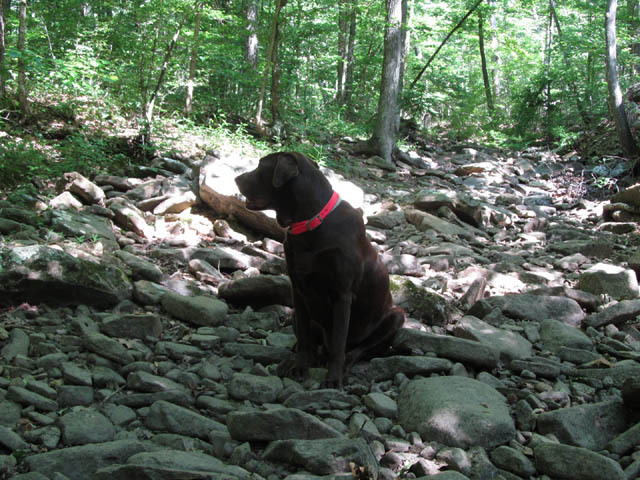 Buffy and I hiked up the dry creek bed on Eagle Mountain where we hiked often in the winter and spring. 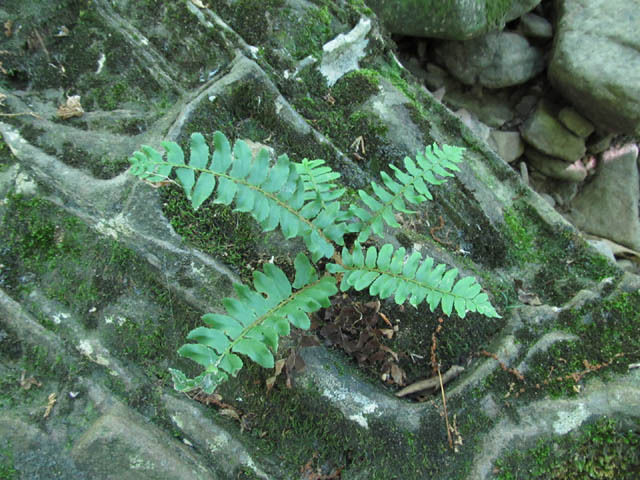 A Christmas fern that I found on one of those hikes was still alive. I was shocked! Shocked because we’re 11 inches behind in rainfall. The fronds were 6-8 inches long. 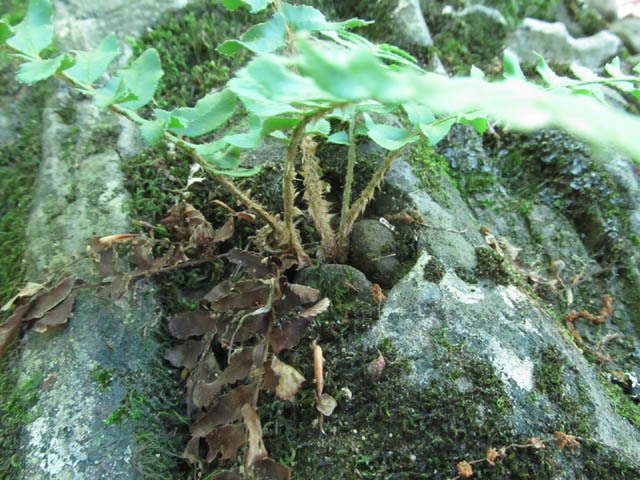 The little fern grows on the rock in the foreground that’s green with mosses. The mosses weren’t dried out, except in a few places. There must be some condensation at night from the humid air. Maybe the fern has a way to compensate too. The cavity it grows in looked to be a tight fit. Buffy and I took a few minutes to just sit. 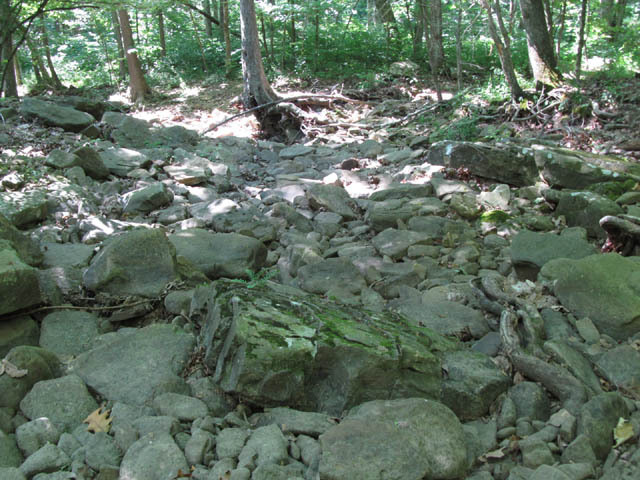 The creek bed isn’t the easiest for walking. A parula warbler gave it’s buzzy call that rose in pitch. A Carolina wren repeated “tea kettle.” Occasionally the wind added its leaf-rustling noise. With the ravine behind me, it gave me a good view of the sandstone glade that rose up from the creek. 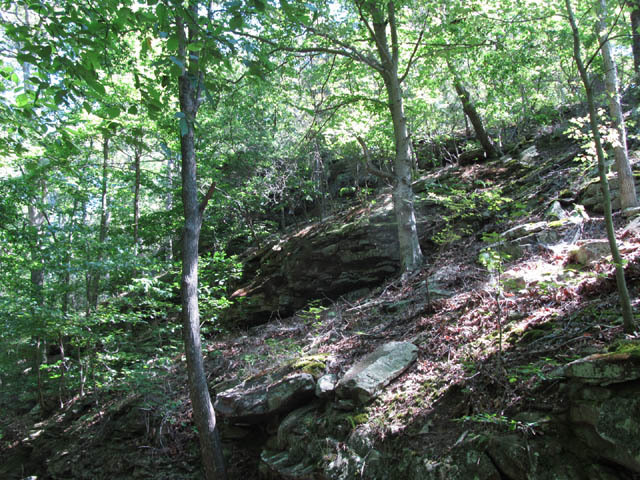 Sandstone glades are a dry rocky plant community. 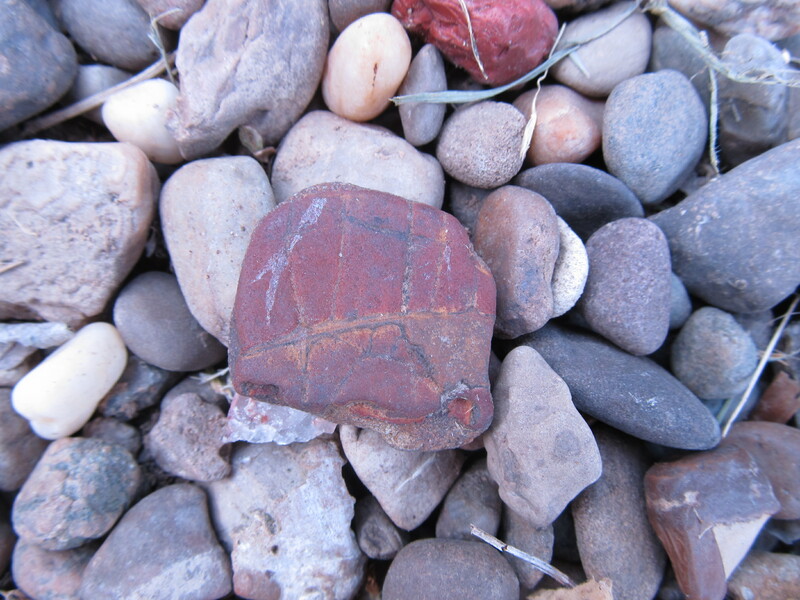 They differ from the sandstone barrens on my rural property by the percentage of rock at the surface. Lots of mosses and lichens grow on the rocks and ground on glades. The trees can be stunted from the harsh conditions. 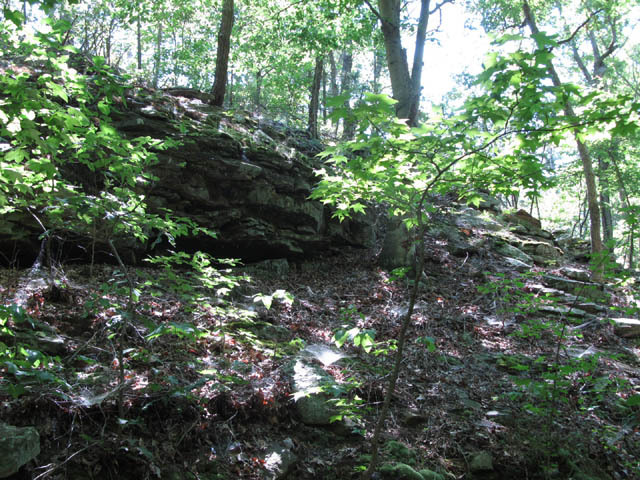 There are also limestone barrens and glades. I usually only investigate the glade here during the winter. The Eagle Mountain area has an abundance of rattlesnakes. Need I say more? 5-25-12 Buffy and I were taking a walk around the yard before the heat of the day arrived. I carried my camera just in case. A quail that called and called but didn’t cooperate for a picture. These moths didn’t know I was close. I snapped 2 pictures. The male is the one upside down. The male flew off after I took the second picture. The female just stayed there. 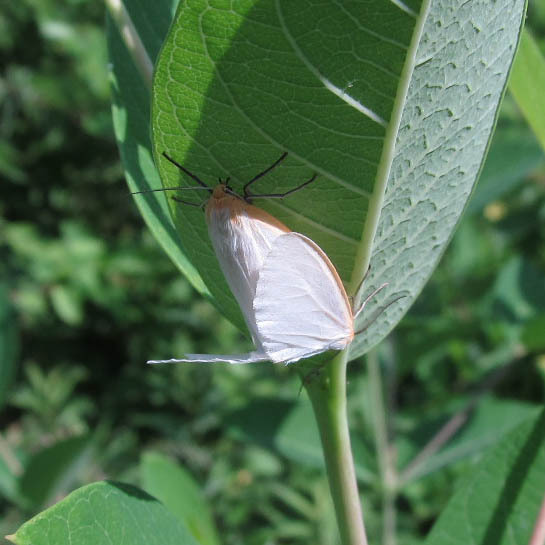 I didn’t realize until doing online research that the moths were on dogbane. Dogbane tiger moths lay their eggs on dogbane. 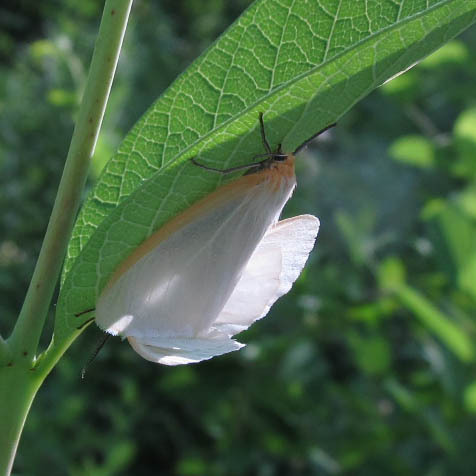 The moths also go by the names Cycnia tenera, delicate cycnia and dogbane moth. 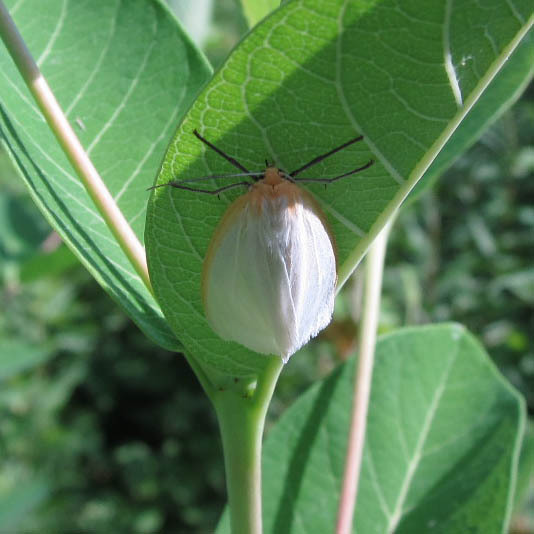 Besides dogbane (Apocynum species) they also lay eggs on milkweeds (Asclepias sp.) Both have a milky sap that make the caterpillars toxic to predators. 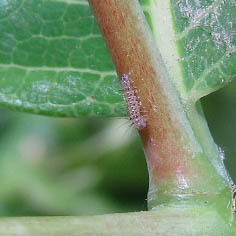 The caterpillars being covered with fine pale gray or whitish hairs might be a deterent to predators too. Plus the caterpillars feed at night. Adults are active at night too. I almost forgot — the moths have a bright yellow abdomen with rows of black spots, which I couldn’t see. 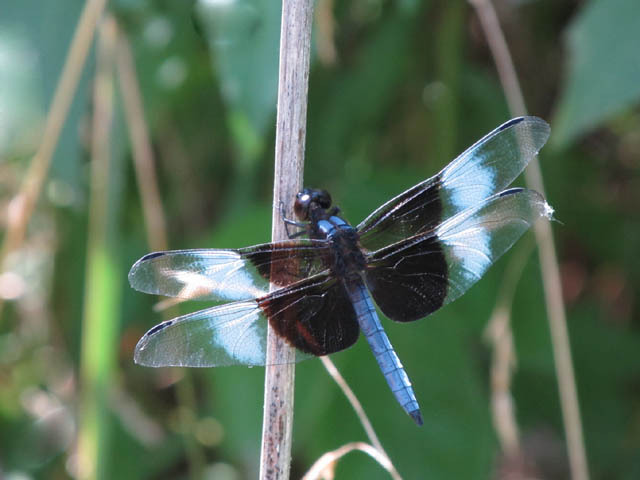 Their wingspan measures 1 1/4 – 1 5/8 inches, and they’re found through the U.S. I will sure be hunting for holes in my dogbane plants, looking for hungry caterpillars. 5-30-12 I took a break from weeding to do a walk-about around the yard with my camera. 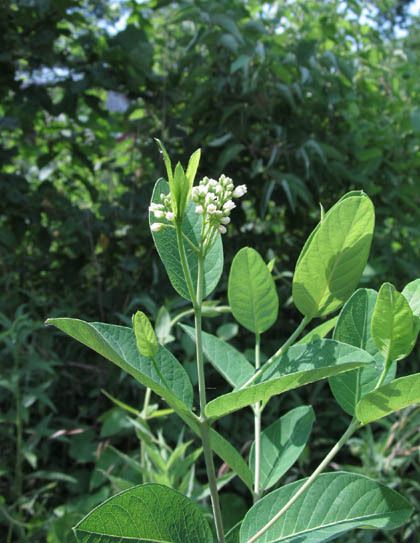 First stop was the dogbane, and there, without any searching, was a cluster of eggs. On the second plant to the right was another cluster. Now I can monitor how long it takes the eggs to hatch … I found them hatching the next morning. I had a “duh” moment, because I didn’t think that another moth might have already laid eggs on the plants. Now I can watch them grow. 6-1-12 I took a break in the afternoon to get out and get fresh air. With camera, I headed straight for the caterpillars. I was shocked. All the caterpillars in the second cluster were gone. I couldn’t even tell which leaf they had been on. Then half or less of the other group were gone too. 6-2-12 Caterpillar numbers were the same as what I found yesterday. So then I didn’t know if the caterpillars were eaten by a predator, if they dispersed or both. Guess only time will tell. The caterpillar was about 1/8 inch long, and its coloring didn’t make it easy to spot. I read that they feed together in groups of 8-10 when young. 6-16-12 I didn’t see any more caterpillars until tonight. And I did look. 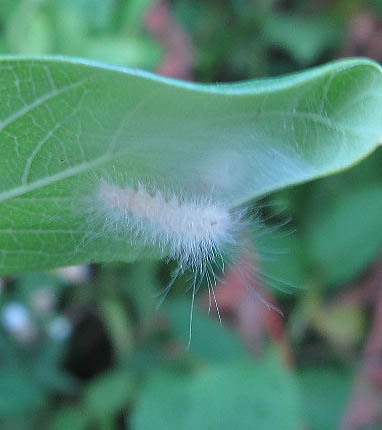 I was making my usual loop around the weed patch, saw tiny droppings on a dogbane leaf, and then found this caterpillar. I located the second caterpillar when I saw a rolled leaf. The caterpillar had rolled the leaf and used it for protection as it shed its skin. The small, roundish area of denser white is the shed skin. I will continue looking for caterpillars. I lack experience rearing moth caterpillars and will be satisified viewing what presents itself.